First Lady and Minister of Education and Sports Mrs. Janet Museveni with H.E Ambassador Attilio Pacifici of the EU, Cedric Merel Head of Cooperation at the EU Delegation and Isabelle D’haudt the Head of ECHO (Humanitarian Aid) Office on her left plus the Permanent Secretary Ministry of Education and Sports Alex Kakooza, the Director Higher, Technical and Vocational Education and Training (HTVET) in the Ministry of Education Robert Ocheing and the Under Secretary F&A Aggrey Kibenge on her right during the meeting at Nakasero State House. 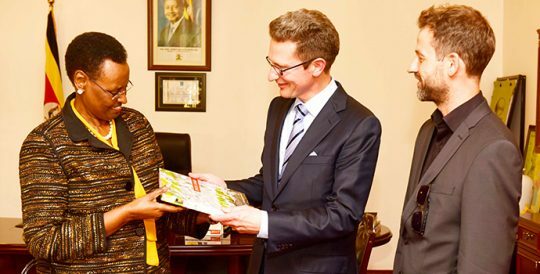 First Lady and Minister for Education and Sports Janet Museveni presents a book “Explore Uganda” to Reinhard Lechner (centre) and Felix Holland representatives of Lucas- Nuelle at State House Nakasero on Wednesday, 15th November 2017. 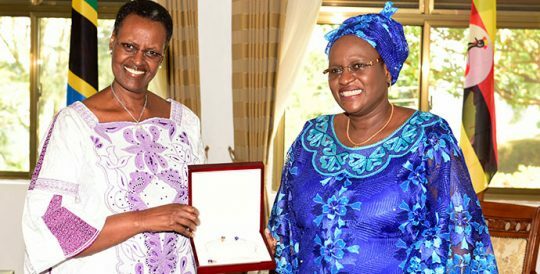 First Lady and Minister of Education and Sports Mrs. Janet Museveni (centre) with H.E. Peter West UK’s High Commissioner to Uganda on her left and David Laws former UK Education Minister on her right and other officials after their meeting on Tuesday at Nakasero State House.